Known as the TulipTree due to the shape of its flowers Liriodendron tulipifera is a widely grown in Australia and is a deciduous tree originally from North America. However it is from the UK that it was most likely imported into Australia with Ruth Tindale bringing in examples from Hilliers Nursery in the UK. Greenish yellow flowers in spring and great autumn color along with attractive winter limbs provide year round interest. Both the species and the fastigate forms have fragrant flowers and aromatic bark. Flowering in late spring to early summer this is a wonderful specimen tree for a larger garden or park situation, the ‘fastigiate form’ can be used to line driveways or as a deciduous screen or shade tree. 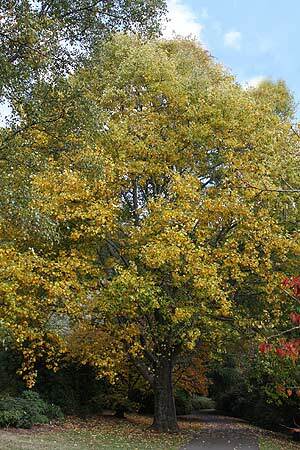 Wonderful green foliage turning to a good yellow in autumn. Liriodendron tulipifera fastigiata (also listed as fastigiatum) is an upright cultivar, tall growing easily reaching 15m with around a 4m spread. The species will reach 20m with a 10m spread a much broader crown. Growth rate is moderate to vigorous reaching 20m in 10 – 15 years. Generally needing little care once established although older established trees, especially the fastigate forms will benefit from some remedial pruning later in life. These trees grow well in full sun to part shade a well drained soil is essential although some extra water during our dry summers may be required especially when trees are young. CORELLA NURSERIES Phone 03 5968 1071, 0428521097 Fax 039756 7387 W holesale nursery with a wide range of bare root semi advanced trees, deciduous ornamental trees, fruit tree stocks and potted products.